The Greek Revolution was a cause for concern for the elites, since it threatened Europe’s social and political balance. Nevertheless, it was greeted with enthusiasm by many ordinary people across Europe and the US, which is undoubtedly partly to do with the Greek origin of so much of the West’s classical heritage. The uprising quickly become a cause célèbre in the Western world, giving rise to a strong wave of what came to be known as “philhellenism,” or the love of Greece and its history. 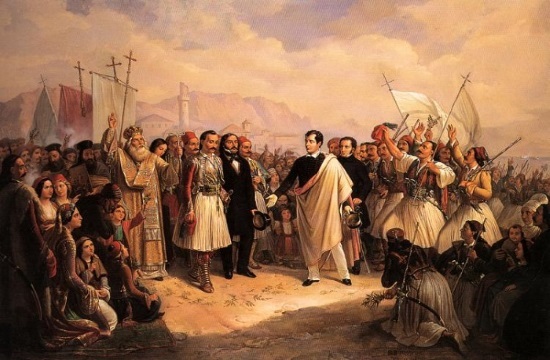 Several wealthy Americans and western European aristocrats, such as the renowned poet Lord Byron and later the physician Samuel Howe, actually took up arms and joined the Greek revolutionaries. The Ottoman massacres of Greeks at Chios in 1822 inspired Eugène Delacroix’s famous painting “Massacre of Chios;” other philhellenic works by Delacroix were inspired by various Byron poems. Lord Byron, the most eminent philhellene of all, giving his name, his prestige, his wealth — and ultimately his life — to the cause. In the summer of 1821, various young men from all over Europe started to gather in the French port of Marseilles to book passage to Greece and join the revolution. Between the summer of 1821 and the end of 1822, when the French started to inspect ships leaving Marseilles for philhellenes, some 360 volunteers travelled to Greece. In Germany, Italy and France, many clergyman and university professors gave speeches acknowledging that all of Europe owed an immense debt to ancient Greece. From the United States came the doctor Samuel Gridley Howe along with the soldier George Jarvis to fight alongside the Greek people. The classicist Edward Everett, a professor of Greek at Harvard, was active in promoting the Greek cause in the United States. In November of 1821, he published an appeal from Adhamantios Korais, which read “To the Citizens of the United States, it is your land that Liberty has fixed her abode, so you will not assuredly imitate the culpable indifference or rather the long ingratitude of the Europeans.” Korais went on to call for American intervention in the armed struggle in many American newspapers. In 1821, the “Greek Committee” in Charleston, South Carolina sent the Greeks 50 barrels of salted meat, while the Greek Committee in Springfield, Massachusetts delivered supplies of salted meat, sugar, fish and flour. In New York City, a charity ball hosted by that city’s Greek committee raised the then-princely sum of $8,000. In Nafplio, the first capital of modern Greece, a monument to honor the philhellenes who died fighting in the war included 274 names, with one hundred from Germany, forty each from France and Italy, and the rest from Britain, Spain, Hungary, Sweden, Portugal and Denmark. But of course the biggest casualty of the war among the philhellenes was that of Lord Byron, who is honored in Greece as a national hero. He gathered money for the revolution by selling his English estate, which raised some £11,250 pounds sterling, all of which he planned to spend on the Greek cause. In today’s money, Byron would have been a millionaire many times over, and the news that a fabulously wealthy British aristocrat known for his generosity had arrived in Greece made Byron the object of much solicitation in a desperately poor country like Greece. He joined forces with Greek rebel leaders fighting the Ottomans near Missolonghi. In 1824 he planned to attack the Turkish-held fortress of Lepanto, at the mouth of the Gulf of Corinth, in spite of his lack of military experience. Nevertheless, before the expedition could sail, on February 15, 1824, he fell ill and died in Missolonghi on April 19. Close to the center of Athens, outside the National Garden, is a statue showing Greece in the form of a woman crowning Lord Byron.